David Gilman is well known for his Master of War series – a series I love – set during the Hundred Years War of the 14th century. 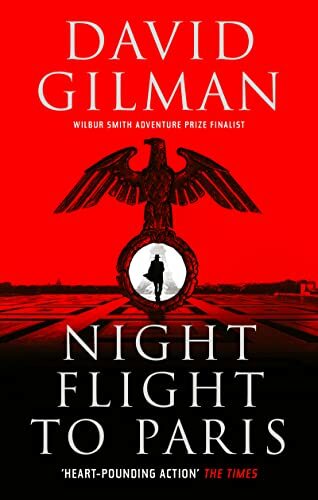 In this standalone novel, David Gilman moves forward 600 years to another conflict and the result, Night Flight to Paris, is every bit as good, if not even better, than his medieval series. This is a very clever novel, its complex, tense plot beautifully crafted and gripping throughout. It starts off running and the pace doesn’t slacken once. Harry Mitchell is a fascinating, likeable, courageous and potentially ruthless protagonist. For much of the time he is almost literally in the dark, forming his cell of Resistance fighters out of strangers, aware that any one of them could be a traitor, and yet camaraderie draws them together. Ultimately, Mitchell is a spy, his whole life in France and Paris is built on secrets and lies and he holds it all together with his cunning and genius. And not a little luck. There are others here that we grow attached to, even though we’re not quite sure if they can be trusted, and they are wonderfully portrayed by David Gilman, each a character in their own right, men and women, young and old, especially a radio operator whose courage is extraordinary. I urge you to read this novel and meet these fantastic characters. To feel the tension of following them through the danger of missions and just in daily life, which can be every bit as terrifying, waiting for a car to screech to a halt outside the door, for the sound of boots running up the stairs, the bang on the door, the guns in the face. Night Flight to Paris is a magnificent war spy thriller. I couldn’t read it fast enough. Clever, complex, gripping, emotionally engaging, terrifying. And so much more. A stand out novel of the year for me and one that kept me reading late into the summer night. German edition’Scourge of Wolves’ enters the bestseller charts at #16.